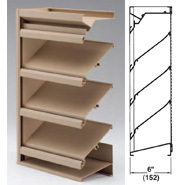 6" Drainable Aluminum Louvers offer excellent free area, welded construction and high water penetration levels. Available with channel frame or flange frame and both insect screen and bird screen options. If you don't find the exact size you desire, select the next larger size. Click the "VIEW DETAILS" button for submittals and additional data available there.